The North GA QRP Club gang have added a new annual field event to the amateur radio contest calendar–a field event with an unusual twist. 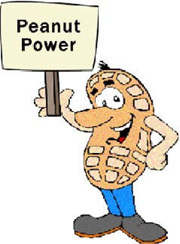 The Peanut Power Sprint is this Sunday, September 29, 2013, from 2000Z to 2200Z. What’s unusual about this event is that it is open to those operators running QRP, those running more than QRP power, those operating at home, and those operating in the field. Participants will be competing against only those who are in the same class. In addition, both CW and SSB operation are allowed and encouraged. Operations are allowed only on 15, 20, and 40m. The recommended 40m CW frequency is 7.060MHz, not the usual QRP calling frequency. Those operators with a “Peanut Power Number” can work anyone; those without a number may work only those with numbers. It’s not too late to request a “Peanut Power Number”. Personally, I’m looking forward to be operating as Peanut Power #105, “Salted” (5w, portable). This entry was posted in Announcements, CW, Events, Portable, QRP, Uncategorized. Bookmark the permalink. Had a great time in the event and even got you in the log! Thanks for pulling my Boiled Peanut signal out for the sprint. Looking forward to doing it again sometime. My station was a Norcal 40A running at 900 mW to an attic dipole cut for 40m. 40m was my only band, and yet somehow I managed to make 15 contacts in 4 different states. There are some GREAT ears out there.